Image: Thulani Mbhele #TotalShutdown marchers meet with President Cyril Ramaphosa at the Union Buildings. President Cyril Ramaphosa said he was deeply upset at hearing the stories of abuse suffered by South African women, as he addressed the #TotalShutdown protesters in Pretoria on Wednesday night. "You have the right to enjoy your bodies, the right to live a life that is happy. And I am sorry - I really am deeply sorry - that a number of women in country have not had the opportunity to enjoy all the rights in the Constitution because they are violated, abused, assaulted and a number are also killed. "This causes me to hang my head in shame, because this is not the way South African men should behave towards the women of our country," he said. Ramaphosa was meeting protesters who had earlier in the day marched to the Union Building to share their concerns over gender-based violence. 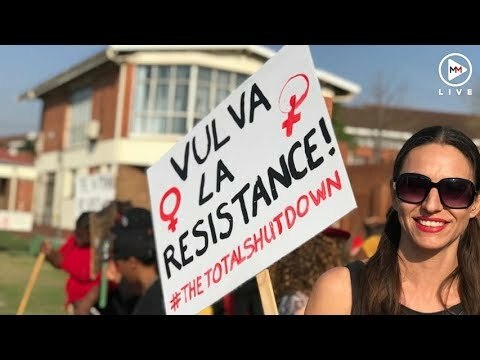 The crowd was protesting under the banner of the #TotalShutdown, which was part of a series of nationwide protests against the scourge of gender-based violence. The march brought the City of Tshwane to a standstill on Wednesday‚ as hundreds of women marched in song‚ some holding hands as others hoisted placards above their heads. Speaking to the crowd of women, Ramaphosa said: "We should behave with respect, with honour, and should appreciate and celebrate you as women and mothers. You bring life into this world. I was brought into this world by the women of our country and it is important for us as men to give that respect to you. And this is the message that I, as president, will be spreading over and over." He added that he was glad they had raised this at the beginning of Women's Month, as it "gives us the opportunity to give more substance and meaning to the interventions we should make to protect the women of our country, to make sure the rights in the Constitution are ones that you, too, as women of the country can enjoy." The protesters had wanted to hand over a memorandum to Ramaphosa, but he was not there. Minister Naledi Pandor was instead asked to receive the memorandum, but the marchers were not happy with this. Ultimately, Ramaphosa said, he thought it best to make the trip to the Union Buildings. He said he was there not just to receive the extensive document, "but [also] out of respect to all of you". "As the president of our country I do have deep respect for the women of our country and take my time to listen to the issues that are raised by the women of our country," he said.